The most durable coating for construction work and industrial applications. EcoDUSTRIAL is a high quality thermoplastic polymer coating. It's the industrial version of our AquaBRIGHT pool coating (by the EcoFINISH brand) which our sister company BSC Pool&Spa has been using on pools on Bonaire for over a year now. Customers are very satisfied with this product and so are we! EcoDUSTRIAL is extremely durable and can be applied to virtually any surface. It looks amazing and is available in many different colors. Lampposts, sea stairs, the back of your pick up truck, buoys, motor parts, your container home, your porch floor, the inside of your water basin or even the markings on the road! 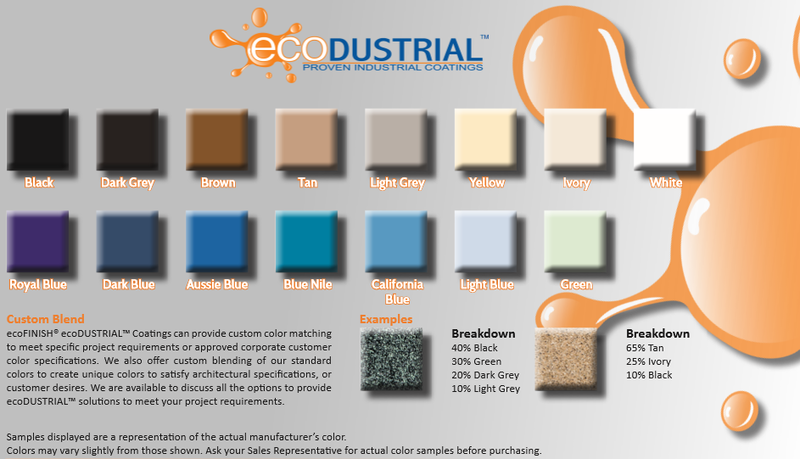 EcoDUSTRIAL is very strong, of extremely high quality and available in any color you like. Also, it is weather resistant and water proof and it can be applied to almost any surface. Because of this, it is suitable for any application you can think of! What can we do for your home or business? We offer 15 standard colors in various shades of blue and natural hues. But we can recreate any color you like! Custom made colors can meet specific project requirements or approved corporate color specifications. Think of the exact colors of your business logo. We also offer custom blending of our standard colors to create unique tones to satisfy architectural specifications or customer desires. Also read about our new sand blasting machine and what it can do!